I had intended my first post from Canada to be about the beautiful train ride up from New York but I got thrown off course by the unexpected cleaning issue. Anyway, we’re all settled in now and have managed to sufficiently de-studentify the place! The weather is beautiful, we’ve done some exploring and later we’re planning to check out some Brazilian hip-hop at, incongruously, the outdoor Jazz festival. It was without much deliberation that we decided to travel to Montreal on the Amtrak Adirondack train. The 11 hour train journey is by far the slowest way to cover the 600km between the two cities but we also didn’t fancy 7 hours in a bus, nor the stressful schlepping around that comprises the flying experience these days. Also we’ve heard the train, which hugs the Hudson River and the shores of Lake Champlain, is one of the most scenic routes in North America and at only $60 each it’s probably the cheapest NY->Montreal option. We left our New York studio at 7am. Stacker reeled off the checklist “Passport? Check. Laptop? Check. Wallet? Check. Ok, that’s all we need.” It’s early so I won’t point out that that may be all he needs but my list is quite a bit longer. I wonder if he knows I’m probably the least successful nomad on the circuit right now. I’ve got no less than 3 dresses, 16 tops, 4 pairs of shoes, my entire collection of earrings, hair straighteners and a slew of nearly-useless nick nacks. 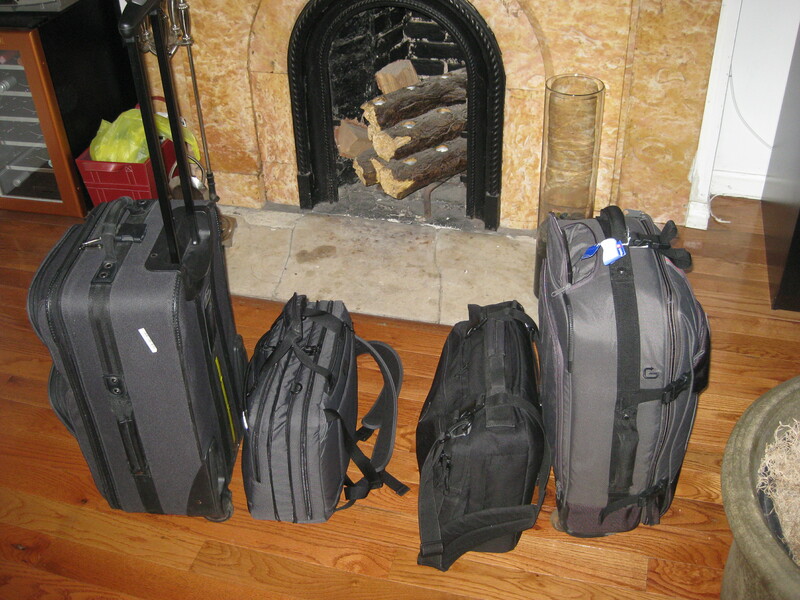 From what I’ve read about other nomads, I’ve seriously over-packed. Still, so long as it (barely) fits in my tiny suitcase it’s coming with me. Also, top of my list that morning was the gourmet Whole Foods picnic I’d carefully constructed the night before. No chance I’m leaving that behind! Anyway, we arrive at the Amtrak station well ahead of schedule, clear the Canadian Check-in and settle into the waiting room. The trains are being announced one by one and we get talking to a Quebecois tree-trimmer while we wait for ours to be announced. Between NY and Albany the immense River Hudson unrolls to the left, cliff-lined and dotted with holiday homes of mansion proportions. It is one of the most stunning parts of the trip, missing from the video above which is of the view from the right side of the train. At this point the right is mostly reeded and lilypadded wetlands and if you’re quick you might spot a heron or two. The wet marsh creeps right up to the railroad itself and it’s a wonder anyone managed to build on such soggy land. Albany itself is beautiful and at the station we’re able to get off and stretch our legs for a few minutes. After Albany we’re soon in lake country and the train skims around the Western shore of Lake Champlain, butting up against it so closely that at times the water is almost lapping at the rails. Once past the lake and into Quebec the view becomes a little more industrial but on arriving in Montreal we cross over another mammoth river, the Saint Lawrence, and are treated to a view of the Montreal skyline as the sun goes down.